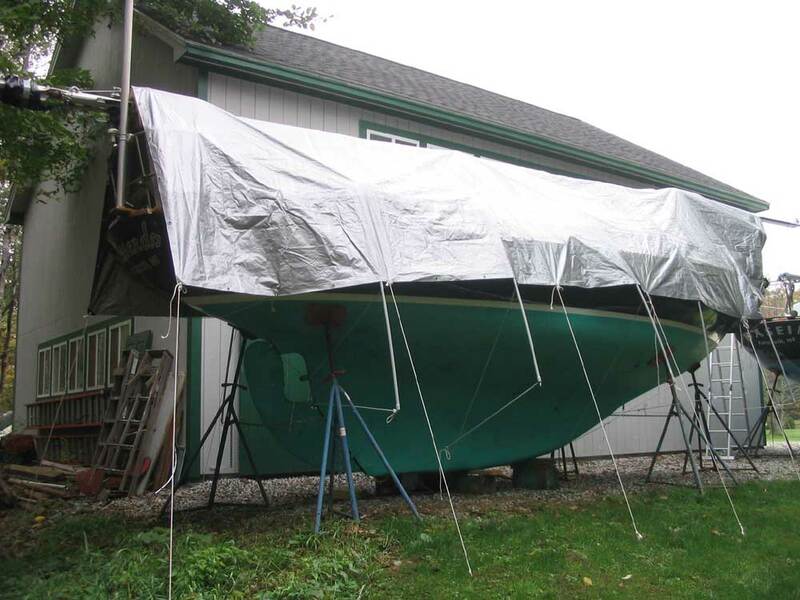 After an early haulout on September 9 (we were going traveling in September, so had to pull the boat early), I prepared to put her to bed for the winter. 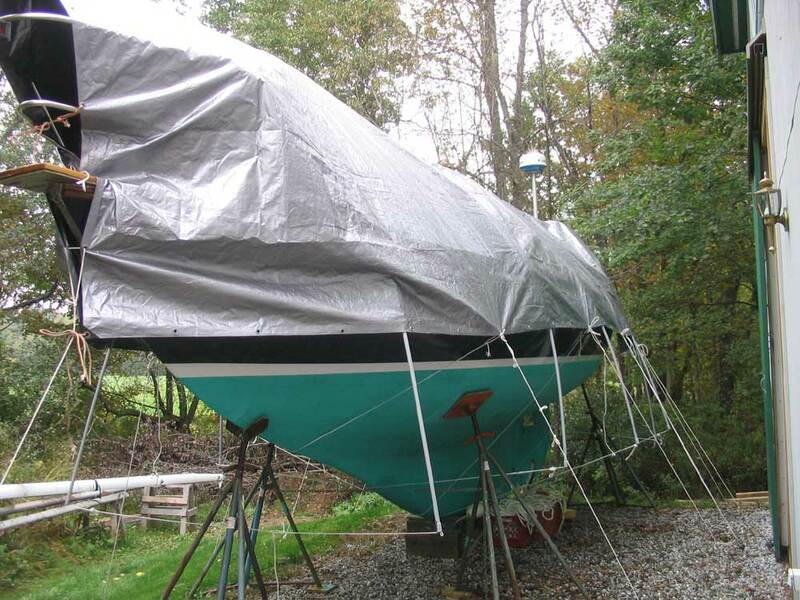 After unloading nearly all the gear on board, I took advantage of a nice day in early October to winterize the engine and cover the boat. It was a good thing I did, too, as the weather deteriorated shortly thereafter, leaving us with 2-3 inclement weeks of rain and misery with nearly no breaks. When I rebuilt the boat, I vowed to disassemble the drivetrain (propeller, shaft, stuffing box, coupling) every other year for inspection, maintenance, and to keep these components free from corrosion that might make removal difficult if ever needed. I was true to my word in 2002, and took apart the various components, cleaned them, painted the couplings, and reassembled everything with lots of water proof grease on threads and mating surfaces to help with later removal. 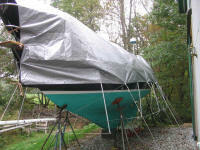 I should have disassembled everything last year, in 2004, but with a busy fall I postponed the chore. Therefore, I felt I had to disassemble the shafting this fall, so I proceeded, hoping that everything would come apart nicely; couplings are notorious for welding themselves to the shaft, making removal difficult. After removing the propeller--sort of a chore since my prop puller requires some modification to work on my boat, which lessens its efficiency--I attacked the coupling. The nuts securing the coupling to the drivesaver, and the drivesaver to the transmission coupling, came off easily, thanks to their coating of waterproof grease. 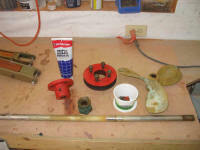 Next, I removed the setscrews in the coupling, which also backed right out easily. Finally, I regarded the coupling itself, and was preparing to head to the hardware store for some threaded rod and spacers that I had determined I would need after the last disassembly in 2002. However, I decided on a whim to just try hitting the coupling with a rubber mallet, just in case. Imagine my surprise (and pleasure) when the coupling immediately began to slide off the shaft--and was free in 30 seconds. Incredible--and an excellent testament to the success of the waterproof grease. It worked better than I had ever hoped it might, and I became an instant convert. I took the components into the shop for inspection, cleaning and maintenance, and later reinstallation. I followed with normal engine winterizing procedures, and also winterized the fresh water and sanitation systems--nothing new here, folks. 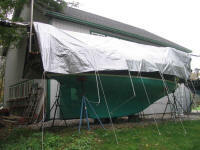 Then, I rigged up my winter cover frame and cover, a simple process that I had done many times. I hate putting the boat to sleep, but it was nice nonetheless to have the cover on and know that the boat was safe and sound.